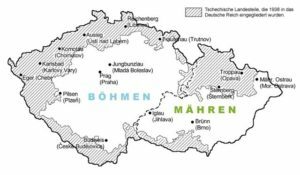 German-Bohemians are people who have either lived in or have ancestry in the outer rim of the Czech Republic. The Czech Republic is comprised of the former countries of Bohemia and Moravia, which were part of the Austrian Empire and ruled by the Habsburgs from 1526 until the end of WWI. When the nation of Czechoslovakia was created in 1919 out of the former Austrian crown colonies of Bohemia, Moravia and Slovakia, the German-speaking outer rim came to be known as the Sudetenland. It was named for the Sudetes or Sudeten mountain range that borders todays Poland and the eastern region of Germany and the Czech Republic. After World War II, three and one half million of these Germans from Sudetenland were forcibly expelled from their homeland and ?resettled? throughout Germany. These too, are German-Bohemians, also known as Sudeten-Germans. Beginning in the early 1850?s, and increasingly throughout the balance of the 19th century, there was a large chain migration to Minnesota, Wisconsin and other regions throughout North America. Motivated by a string of immigrant letters, hundreds of immigrants joined their families and brought with them elements of the culture, crafts, traditions, music and values that characterize the descendants of these German-Bohemian immigrants to this day. The Map Included is from a Sudetendeutscher Atlas printed in Munich Germany in 1954. It is a map created in 1938 and the grayed border regions show the area considered to be the Sudetenland.